The following is an open letter to the State of Israel and the Jewish people which questions the continuing condemnation of the Republic of Croatia, its citizens, Diaspora inclusive of its past present and future particularly in light of negative media posts regarding our recent world cup success. We ask that you share this with those you know in an effort to bring fourth open dialogue and reconciliation. Admiral Isoroku Yamamoto, commander and architect of the Japanese attack on Pearl Harbor spoke the words “I fear all we have done is to awaken a sleeping giant and fill him with a terrible resolve” This statement was made soon after the decision was made to forego the 3rd wave of the planned attack and the withdraw of his armada to safe waters. He had won a major battle, yet as he knew from years spent in the United States prior to that fateful day on December the 7th 1941, the short-term euphoria of the Japanese would end in tragedy for them. I write this open letter to the people of Israel, and to the followers of the Jewish faith, Diasporans as are we Croatians, who live outside of our mutual lands in response to the continuing attacks upon the Croatian people and culture by those among your own that employ the same tactics of unsubstantiated claims as did the Nazi’s of world war two during, and in the years leading to, your Holocaust. The modern state of Israel is to be admired on numerous levels, we as Croats admire your peoples resolve to perpetuate both your religious beliefs and the memory and history of your culture. In these respects, and many others, we are much alike, however, due to the efforts of some, Israel risks awakening a sleeping giant. The history of the Croats dates back almost 2 millennia in terms of its European history, prior to that it is believed that we originated in the same middle eastern territories which Israel is a part of today. As are those of the Jewish faith, our belief ,as predominantly Roman Catholics, has held us steadfast while at times hindering our self-determination, prior to WW2, those of the Jewish faith suffered much the same affliction, constantly subservient to the will of other powers eventually to suffer the ultimate form of human malice in the genocide of 6 million of your people. It was this event that forged a new resolve in you all, one that would dictate that never again would your people, no matter where they dwelled upon this globe, tolerate the betrayal of their rights. We as Croats between May 1945 and the end of 1947 also suffered the extermination of an estimated 1,000,000 of our people at the hands of the communists, these were unarmed men women and children whose remains in most cases lay in unmarked but known mass graves across the former Yugoslavian territories. Unlike those of the Jewish faith who’s loved one’s ashes were scatted into the skies to be carried away, denying you all of being able to mourn their memories in a physical sense, our grief is that the remains of ours lay in state as they fell, and we are unable to mourn them even though we now know the location of in excess of 1,700 sites. Simon Wiesenthal is quoted as saying, “For evil to flourish, it only requires good men to do nothing” his legacy is that he was a man who did something for his culture and his peoples belief, are all Croats therefore who wish to do something for their lost bad men? Or are we men cut from the same cloth and beliefs? Simon Wiesenthal’s legacy however is being brought into disrepute, no longer is this a benevolent enterprise but rather a corporate one. You the reader need to ask yourself, Would he condone the use of the Jewish tragedy to perpetuate mistruths? Would he jeopardize the legitimacy of the work he undertook by the revelation that his legacy was using these mistruths to somehow gain further focus on the plight of the Jewish holocaust? I believe if he were still alive that the answer would be no. As I mentioned earlier, the Croatian people suffered their own holocaust, even though it is somewhat known of today, it is also shunned, in some instances it is deemed justifiable as was the more recent event in Srebenica Bosnia Herzegovina on the 13th of July 1995. What drove Ephraim to make this statement, was it perhaps political? Croatia during the second world war, as was the case with its neighbors, allied with Nazi Germany, this resulted in the establishment of the NDH (Nezavisna Država Hrvatska) Independent State of Croatia led by political and military leader of the Ustaša Dr Ante Pavelić. The regime (as many non-Croatians refer to it) has been labelled as a killing machine that surpasses that of then Nazi Germany and contributed greatly to the Jewish Holocaust, yet beyond what has been revealed about it by communist Yugoslavia between 1945 and 1990, the world is oblivious to factual evidence suggesting that this was not the case. The NDH recognized Catholicism, Orthodox Christianity, Islam and Judaism, all four faiths were represented not only by places of worship, but what will be surprising to many of the Jewish faith, representation in both the Government itself and the military, the following expands upon the latter 2 points. Upon declaration of the Independent State of Croatia on the 10th April 1941 , the establishment of state apparatus, civil service , army , police , and all other supporting civil authorities was undertaken. Within the state apparatus, citizens of the Jewish faith quickly occupied key positions with a significant number of the senior government , military and police positions occupied by Croatia’s highly-assimilated Jewish community. Otto Krezimir Head of the Ustasha secret police. Ivo Heinrich Managed the Jasenovac camp and also a very close friend of Dr Ante Pavelic. Dr. Stipe Mösner Plenipotentiary Representative to Bulgarian government. General Milan Miczler Commander of Constabulary ( gendarmerie NDH ) . Colonel Bozidar Zorn First commander of the Second Mountain Brigade , and later of Ninth Mountain Brigade. This information is suppressed, the question is why ? and what other information exists that Croatia’s detractors would rather not be released from the Modern Croatian Republics archives that would put at question the legitimacy of communist Yugoslavia’s past and has become the basis of an ongoing campaign against the Croatian culture? Those same detractors claim any such information is a blatant attempt of historical revisionism. A constant barrage of allegations have been aimed at the modern day Croatian Republic since its moves towards independence and the ensuing war for independence in the 1990’s, that barrage has once again been increased in the past week against the public and a very global display of National pride shown by the Croatian people with the recent second placing in the FIFA world cup finals. Yet the dark specter of our perceived WW2 past has once again been thrown under the spotlight by those that would associate any such patriotic displays with it as seen in media commentary which is predominantly being broadcast by Jewish and Serbian reporters through mainstream media outlets, such as Newsweek, The Times of Israel, Balkan Insight, Haaretz, and of course Efraim Zuroff via Associated Press, we ask why? Intriguingly the articles are clone like in their observations and accusations and carry no substantiating proof, rather, they utilize a select format and tried and tested set of arguments which fail miserably when deconstructed and scrutinized. Once again, we pose the question why ? and why again is Zuroff seemingly the circus ring master that these journalists gravitate to? Newsweeks Cristina Maza came under heavy criticism for her article, a link to the original text which has now been altered 3 times by Newsweek along with 3 amendments to the title and an apology from Newsweek as a post script at the bottom of the article was critiqued, the results of which were alarming. The following link points to the deconstruction. The Croatian world-wide community poses the following question to its Jewish friends, are you as a proud people willing to examine jointly the entire Croatian / Jewish question to once and for all bring an end to this conflict? Many reading this will assume immediately that I along with other concerned Croats are the right wing, Ustasa fascist offspring we are accused of being, and this would be correct, we are nationalistic, we are central right, and yes many of us are decedents of Ustashi, the same Ustashi made up of thousands of regular army troops who totaled some 200,000 on the 15th of May 1945, along with some 400,000 civilians surrendered to the British 8th army on the plains of Bleiburg Austria. Those souls were handed over to Tito’s Partisans and were murdered across Austria and Slovenia, some were sent on death marches back into the newly created Yugoslavia where they joined some 400,000 others who were put into concentration camps and progressively murdered up until late 1947. One such camp was Jasenovac, the famed death camp of the NDH Ustashi. 73 years have passed since the last shots of WW2 were fired, the entire truth as to what occurred in Croatia at that time will never be known, and it would be foolish to claim that there were no miscarriages of justice during that time, this is a fact we as a people must also face. Jasenovac is the key to this entire question, buried within it lays the truth, a truth we are not afraid of, a truth we believe in, a truth that will set both our peoples free, it will hopefully lead to further examination and the eventual opening of the closely guarded archives of communist Yugoslavia which still lay under lock and key providing us with Lustration which we have been denied. We call upon the good people of Israel to do something, the ones that Simon Wiesenthal refers to when he stated “For evil to flourish, it only requires good men to do nothing” we ask you to question your Government, to become the benevolent people your loved ones who faced a similar fate as ours would have expected you to be. Our proposal is simple, we call upon the people of Israel to call upon your Government to call upon the Croatian Government to act, for an independent international team to be assembled to examine and exhume the Jasenovac site as a first step. These are our rights under the 1948 UN Convention on the Prevention and Punishment of the Crime of Genocide which has no statute of time limitations. Has the Fascism and communism this world fought to assign to history actually triumphed, and have you all, victims of the holocaust, become the oppressors condemning the innocent on national and racial grounds while allowing the perpetrator to walk free ? 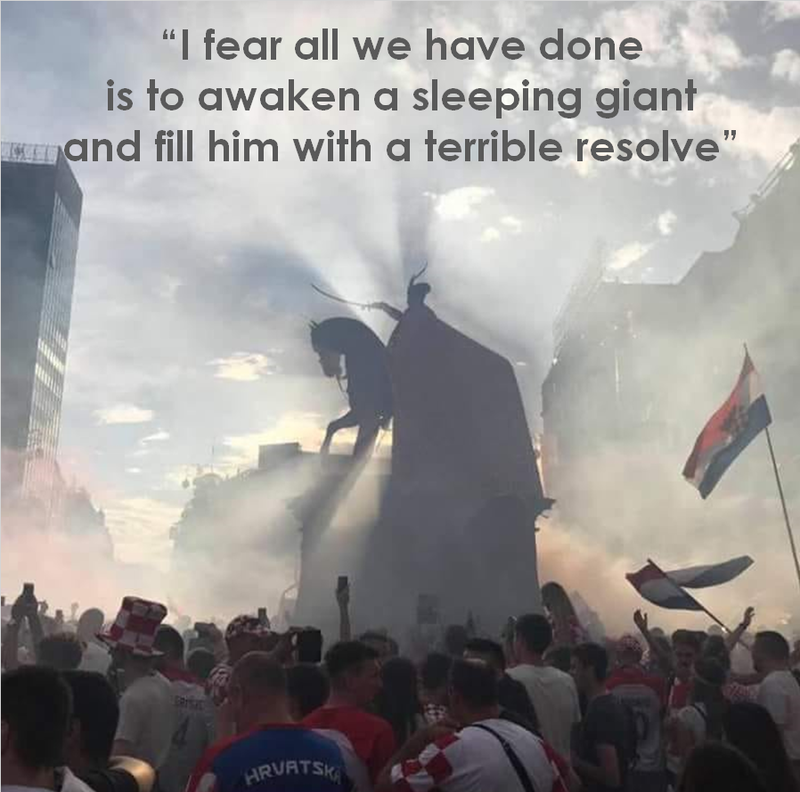 The Croatian people will continue to carry the flame of freedom and will remain focused even when others have succumb, we will continue absorbing the barrage we face, however, the eventual probability is that it will awaken a sleeping giant and fill us with a terrible resolve, we are no longer asleep, we have collated much, our detractors are about to feel our wrath, we are a nation of 4 million, and a Diaspora of equal size. Not since Psenicnik, have i read something so good! Bravo John! A man I met and admired as a teenager. – an awesome read John.. stating it as it is, bok. I have not read such a good article in 30 years, Congrats John !!!! Bravo Jhone Well writen I hope through our Jewish Croatians will help us achieve what you address in you letter the Croatians have suffered with the terrible allegations slender from the Jugokomunists about Croatia and its people. Hope Israel people’s and it’s government help to resolve all this allegations against Jewish people’s. That is a big key to a very large lock Kris, and for our Jewish Croats to come forward would certainly impact the call to action. We need to embrace all possibilities under a proper investigation, the Croatian people unlike the Germans and Japanese never had the opportunity to face reconciliation after WW2 as we were enslaved to a communist totalitarianism which created a fantasy land around us, we deserve our opportunity and Jasenovac in my opinion is the start of that journey. Articulate, considered; well written John. 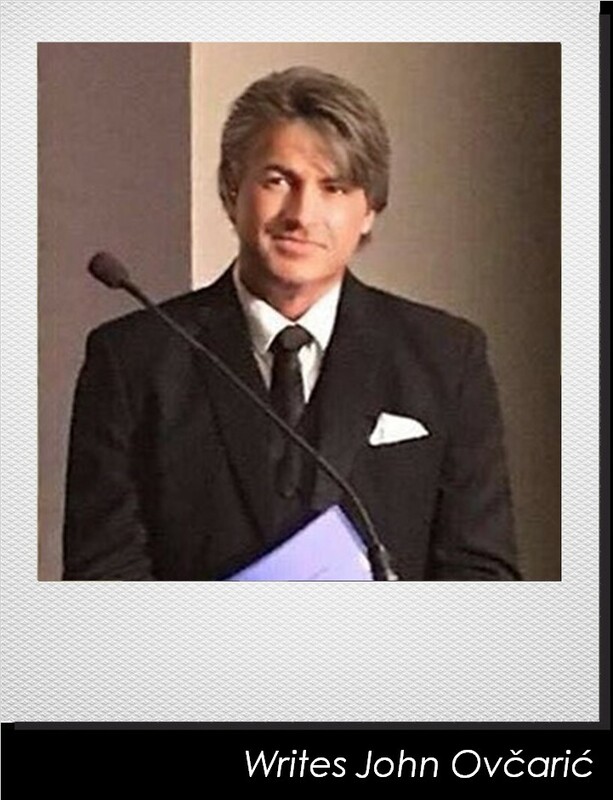 I Thank God for giving us croatians people like john because God says to persevere in truth. Neka znaju da nas ima ! Our argument in the Diaspora is not one which would tell you how to live, self determine, or otherwise, it is to ask what is happening to the nation our veterans and people fought for for surely today’s modern republic is not it.